UN children’s agency UNICEF confers the formal title of UNICEF National Goodwill Ambassador to actress, model, television host, recording artist, and entrepreneur Anne Curtis. Curtis is the new addition to a long list of UNICEF Goodwill Ambassadors around the world that actively support and promote children’s rights, such as Gary Valenciano, David Beckham, Orlando Bloom, Millie Bobby Brown, Jackie Chan, Priyanka Chopra, Ricky Martin, Leo Messi, Liam Neeson, Shakira, and Lilly Singh. “UNICEF Goodwill Ambassadors are well-known personalities who are willing to do their utmost to mobilize support for children. They are volunteers who demonstrate a high level of commitment to children and to the organization. 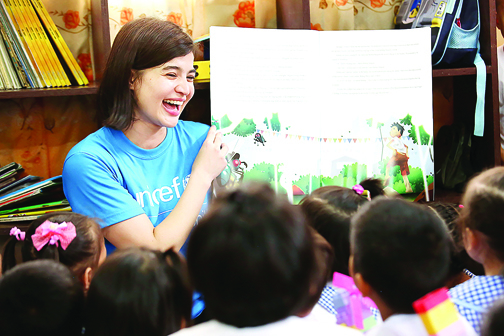 Anne’s dedication to UNICEF and the rights of children has shone through her many projects and initiatives that promote awareness and raise funds,” Lotta Sylwander, UNICEF Philippines Representative says. Anne’s relationship with UNICEF started when she became a major donor in 2009. Her closer involvement with UNICEF led her to being appointed as a celebrity advocate in 2014. Anne’s special projects with UNICEF include the Heroes for Children runs to support children’s First 1,000 Days, fundraising through her international marathons, and a children’s book that encourages reading and instilling confidence in one’s self. During her stint as a celebrity advocate, she visited Leyte province in 2015 in the aftermath of super typhoon Haiyan, and Samar province in 2017. She has also kept herself updated on UNICEF’s various programs through briefings with program experts in the areas of Education and Health & Nutrition. Anne will continue her support to UNICEF’s various advocacies, including education, Violence Against Children, and adolescent health and development, among others. Bong Go’s life story was featured in ABS-CBN’s Maalaala Mo Kaya (MMK) last Saturday with young actor Joseph Marco as the former Special Assistant to the President and Philip Salvador as President Duterte. If you missed last Saturday’s episode, you still can watch it on iWant,ph (just log on and hit MMK Feb. 9 episode). With him was actor/friend Cesar Montano. Go with the young businessmen distributed some 10,000 tikoy to families in barangay Camarin and Barracks. The Anvil officers that joined Bong Go were Chairman Wilson Lee Flores, President Patrick Cua, Honorary Chairman Reynold Siy, Honorary Chairman Marcelo Co and Project Head Joeben Tai. Bong Go also made sure the recipients would have free eggs and cooking oil for cooking the tikoy. Anvil’s civic project of sharing 10,000 tikoy is the young Filipino Chinese entrepreneurs’ way of wishing the whole Philippines a prosperous new year. Anvil has many economic and civic projects, like free college scholarships, disaster relief donations and the annual Sept. 28 Teachers Day honoring all Philippine teachers on this birthdate of great teacher Confucius. A homecoming fit for a queen is what awaits Miss Universe 2018 Catriona Gray when she returns to the Philippines. Gray, who is based in New York City during her reign, has been fulfilling her duties as Miss Universe and is set to fly back to the country on Feb. 20. Alongside her Binibining Pilipinas family, Gray will hold activities with select media and VIP guests, and participate in charitable activities with the BPCI Chair, Stella Marquez Araneta.